Floridians know that Christmas means citrus, and while life took this girl out of her home state, oranges are still synonymous with holiday flare at Moore Manor! I was planning my follow up to the DIY Home Scents for the Holidays: Part 1 post and got sidetracked by a beautiful trip to Costa Rica, which actually was quite serendipitous. I arrived off the airplane in Florida to be welcomed by a HUGE basket of sour oranges, thanks to my parents' neighbor Valerie. Look at this amazing bounty of backyard citrus! The sour orange (also known as the Seville orange) is a hybrid known for it's bitter taste (I find it similar to a Meyer lemon) and beautiful aroma. It smells amazing, and it's beautiful. Every time I walk into my bedroom and catch a whiff or catch sight of it, I can't help but smile. It's so feminine and pretty... even if it's a little grandma chic. Whatever, get off me. I love grandma chic. *This gallery contains affiliate links. This means that if you click through and give the product a whirl, I get a tiny fee for spreading the news at no extra cost to you. This helps me offset the enormous amount of time that goes into Compost & Cava. Wash oranges, scrubbing peels. Slice oranges as thin as you realistically can. Don't fret if they get a little irregular. Cover baking sheet with parchment paper. Layer orange slices and other fresh ingredients (I threw in some rosemary). You can also arrange items directly on oven grill rack to reduce cooking time. 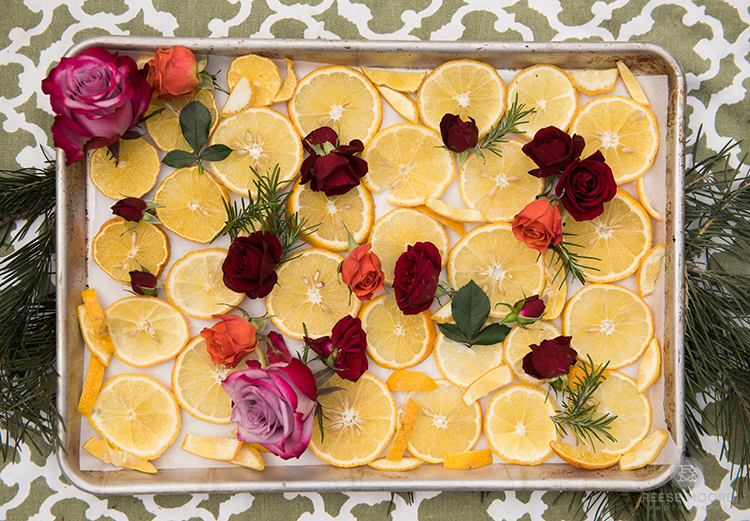 Allow oranges and flowers to cool. Combine with spices in bowl, spritz with essential oils if stronger scent is desired or as scent begins to fade. 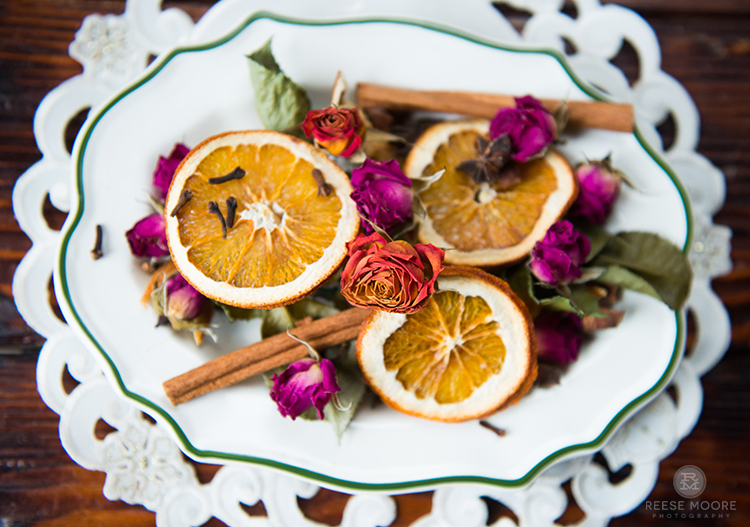 Enjoy until potpourri loses color or texture, then compost! And there you have it! Easy, fun, and pretty. Best of all, it won't release toxins into your home! I packaged up several in glass jars for fellow hippie friends, and played around with creating an orange lavender version, and loved it. I've left mine out in bowls around the house, and I refresh them with the occasional spritz of essential oils. They brighten my mood each day! Living greener often means slow living, and so far I love it. It's a richer, and more fulfilling experience. It's colorful, nostalgic, and the scent lasts for days and days! 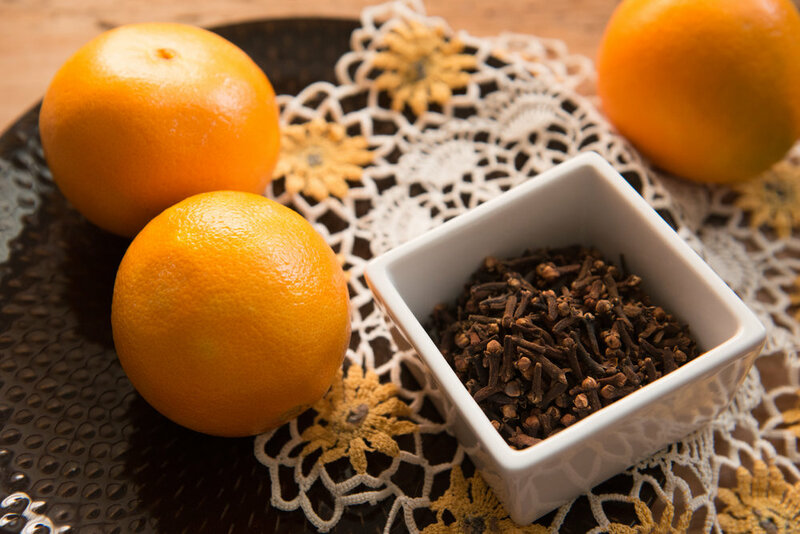 Grab several oranges and a handful of whole cloves. Push cloves (pointy end first) into the peel of the orange. Aaaaaand you're done. So simple, right?! And you can get fancy with patterns if you want, but it's definitely not necessary. 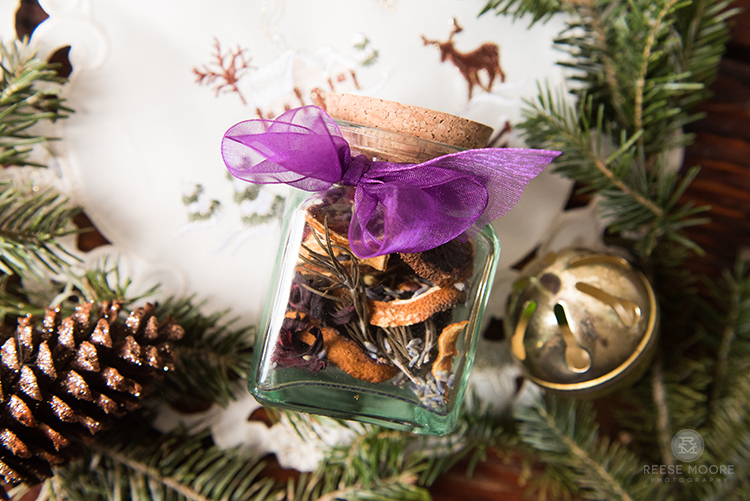 Remember to take a moment to breathe and relax this holiday season, and remember that these little details are where the joy is found in life. Even if you're on a tight budget, these little sensory experiences are a great way to treat yourself while taking a break from wrapping presents and food prep! Shoot me a note and let me know what potpourri combinations y'all come up with!